Squat Variation: Is the Goblet Squat useful? Often promoted to build your booty (gluteus maximus aka glutes), it does not provide the range to activate that muscle fully and hence does not really work the glutes. More often than not the dumbbell used for the exercise touches the floor way before you can complete the range for a full squat. Hence, it is more of a deadlift than a squat. 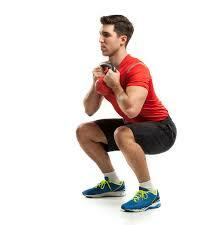 Remember, a full squat (completed in full range of motion) is what builds and strengthens the glutes. Squeezing the muscle on full hip extension does not give any extra benefit.